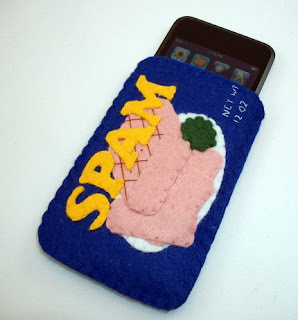 As a curator of questionable crafts, I've seen a lot of iPod cozies. A felted, crocheted, cable-knit, fleece-lined, hand-dyed, Velcroed, moustachioed, cassette-tape-themed whole lot of them. But every once in a while an MP3 cozy/sock/pouch/case/wallet/holder makes a Very Special Impression. Here's a (felted) case in point.